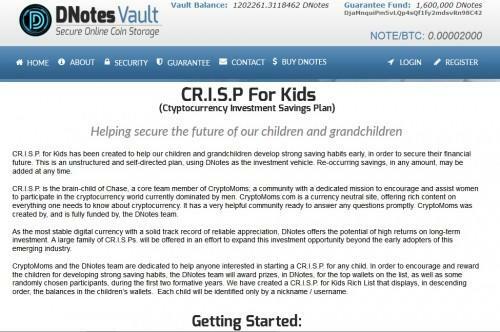 DNotesVault, a secure web wallet launched just a week ago has reaffirmed its mission to build a large generation of DNotes stakeholders worldwide by offering a family of CR.I.S.Ps. (Cryptocurrency Investment Savings Plans) with 100% deposit guarantees. "It is a strategic vehicle created by the DNotes team in pursuit of mass consumer and merchant adoption, taking full advantage of DNotes being the most stable digital currency." Says Yong. DNotes is a Bitcoin alternative digital currency. However, unlike Bitcoin, which has been wildly volatile, DNotes is the most stable digital currency among over 500 competitors listed on CoinMarketcap. Building a stable trustworthy currency has been DNotes' core mission since launch almost a year ago. With an impressive track record of consistent up trend of higher highs and higher lows, DNotesVault was created to encourage and assist consumers and businesses to participate in the potential high returns of digital currency, by starting with a digital savings account. According to Yong, being the first among a potentially large family of savings plans, CR.I.S.P. for Kids has been created to help the world’s children and grandchildren develop strong saving habits early, in order to secure their financial future. This is an unstructured and self-directed plan, using DNotes as the investment vehicle. Re-occurring savings, in any amount, may be added at any time. CR.I.S.P. is the brain-child of Chase, a core team member of CryptoMoms; a community with a dedicated mission to encourage and assist women to participate in the cryptocurrency world currently dominated by men. CryptoMoms.com is a currency neutral site, offering rich content on everything one needs to know about cryptocurrency. It has a very helpful community ready to answer any questions promptly. CryptoMoms was created and fully funded by the DNotes team. CryptoMoms and the DNotes team are dedicated to help anyone interested in starting a CR.I.S.P. for any child. In order to encourage and reward children for developing strong saving habits, the DNotes team will award prizes, in DNotes, for the top wallets on the list, as well as some randomly chosen participants, during the first two formative years. The team has created a CR.I.S.P. for Kids Rich List that displays, in descending order, the balances in the children's wallets. To ensure privacy of clients each child will be identified only by a nickname / username. A large family of CR.I.S.Ps. will be offered in an effort to expand this investment opportunity beyond the early adopters of the emerging Bitcoin and cryptocurrency industry. Yong went on to say that there have been a lot of interest to offer additional savings plans for students, employees, charities and others. The beauty about DNotesVault is that additional plans can be added quickly and still be afforded the same security, easy of use, and full deposit guarantee at no cost. The next savings plan will most likely be CR.I.S.P. for students. There may be little everyday people can do about the current student debt crisis but the CR.I.S.P. team can certainly encourage and assist the next generation to be better prepared. Being born at the time of the digital age, students are more receptive to Bitcoin and cryptocurrency as the future of money. Many Universities and Colleges are already offering cryptocurrency classes. DNotes is committed to working with students around the world to give them an early start. The DNotes team encourages interested students and faculty members to contact them at: contact@DNotesCoin.com. Yong, a well regarded pioneer and visionary in the early generations of portable computers and wireless communication, concluded that cryptocurrency is the greatest technological revolution since the internet which has put fax out of business and postal services struggling for survival. Bitcoin and cryptocurrency is even more massive and hugely disruptive to the current financial systems and global payment network, among others. Although there will be serious job losses among affected industries, there will be massive job and wealth creation. For the first time, early adopter small investors might have the chance to gain financial freedom from relatively small investments made on a disciplined and regular basis. With their 100% cryptocurrency deposit guarantee, free giveaways, and secure cryptocurrency storage platform – CR.I.S.P. just made it a lot easier. -This press release is for informational purposes only. The information does not constitute investment advice or an offer to invest.